On the question of the Republic it appears that they had the impression of finding themselves face to face with an unexpected event, and in this case the electors of Rauf Bey would have had also the right to be informed of his views as Deputy for Constantinople and as a person who had previously occupied high offices. Permit me, Gentlemen, to put a question also on our part to our interrogators. In what way did they inform themselves about public opinion? Do the electors of Constantinople consist of two journalists? Or was it possible that all of them had entrusted these two with the mandate of consulting the opinion of their deputy? And in addition, did they want to prepare a suitable soil to get Rauf Bey to say that he respect fully adjudged this right of interpellation to his electors; that he was grateful for the confidence which they had shown him during his election, that he would endeavour to prove worthy of this confidence, and that the electors could be sure that he would endeavour to the last limit of his strength to fulfill the mandate which they had en trusted to him in every place and at every time? It is true that such language very well befits a deputy who ad dresses his electors, under the condition, however, that it is done at the proper time and in a sincere spirit. On the other hand the assur ances that he will fulfill the mandate of the electors at every place and all times have no meaning if they constitute an answer to a question put for the purpose of insinuating that public opinion finds itself face to face with an unexpected event. When I tell you of events which took place on the night of the 29 th 30 th i n Constantinople, you will easily grasp the real feelings of the people of this town as well as those of the whole nation. On the night of the proclamation of the Republic, Shukri Naili Pasha, Commandant of Constantinople, had been invited to a banquet which the representatives of the people of Constatinople had or ganised in the municipal club of Fatih*). During the dinner the Pasha received an official communication from Angora. Before applying himself to it, he read it to the honour able representatives for Constantinople. The communication con tained the following: The Grand National Assembly of Turkey have decided to proclaim the Republic. Will you announce it by a salute of 101 guns?” The representatives of the people of Constatinople received this good tidings with great joy and loud applause. They immediately congratulated the Pasha in the name of the entire population of Constantinople and also congratulated each other. Under these conditions it required a good deal of audacity to make declarations and demonstrations in the name of Constantinople and misrepresent the true feelings of this honourable people. Are these words an answer to the question which was put to him? Was this question put for the purpose of hearing which form of government would be the most suitable? Rauf Bey clearly avoided expressing his opinion. Speaking of certain old and well-known theories, he declared his conviction that states could only move on two different planes, one of which was absolutism. *) See page 489. Fatih is the name of the district of Stambul in which the mosque dedicated to the Conqueror is situated. The monarch has, so to say, received the right of governing from God, and his rule has thereby received its lawful right. This system of Government having inconveniences, nations have revolted in order to restrict the rights of the sovereigns and to subject them to certain conditions . . . Our nation has also in these last years taken up the fight for the constitutional system and has followed the aim of taking its affairs into its own hands, of seeing and deciding everything for itself. The Party of Union and Progress have forced the right of dis solving the Chamber of Sultan Mohamed V. for the purpose of abscond ing themselves from the despotism of the Chamber. “I do not believe that an alteration of the name could change or dissuade us from our design. Besides, a new system of government substituting another could only impose and maintain itself under one condition, namely, by proving that it corresponds to the wishes of the crushing majority of the people, that it secures the welfare of the nation, and safeguards the dignity and independence of the country. Gentlemen, I should like to pause a little over the last declarations which Rauf Bey has made in explanation of his convictions. Rauf Bey is no partisan of an absolute monarchy, which has the power of dissolving the National Assembly; he is for a system which permits the National Assembly to have the character of a constituent assembly which can practise the national sovereignty without restriction or reserve. Let us clearly define this system. It is known that according to the wording of this Constitutional Law the President of the Assembly has the right to sign in the name of the Assembly. It has also been foreseen that the President is at the same time the natural President of the Council of Ministers, but it is not expressly stipulated that he is the Chief of the State. Considering the conditions and conceptions which existed at the time when this Constitutional Law was elaborated, it is easily to be understood that at that time the necessity existed for omitting an important and essential point in the law. This omission resulted, up to the day of the proclamation of the Republic, in nourishing the hope of those who, in spite of the existence of the National Assembly and their Government, persisted in the belief that, after the abolition of the monarchy, the Caliph was the Chief of the State. According to the system which Rauf Bey pointed out to be the most eligible he undoubtedly regarded the Caliph as the Chief of the State. The real reason for the alarm of Rauf Bey and his supporters after the proclamation of the Republic was the fact that the President had been endowed with the dignity of the Chief of the State. Rauf Bey did not confess his hostility against the Republic. But does not the fact of his speaking of the necessity for certain con ditions for its maintenance on the very day of its proclamation clearly show that he did not believe that the happiness of the nation could be assured through the Republic? What did he mean public opinion to understand by such a warn ing? Where is the danger against which he wants to protect the nation? I believe that it is not difficult to guess this. Up to the time when success could have been secured in safeguard ing the position of Chief of the State to the Caliph, Rauf Bey did not wish that this place should be occupied by another under a different name; but as this occupation had already taken place Rauf Bey incited public opinion to a reaction for the purpose of annulling this measure. Having pretended that a grave mistake had been committed through the adoption of the republican form of government, it is natural for him to believe that it would be a great benefit to return on the road of error, never mind how far one has gone already. If, speaking of irresponsible persons he thought of those who had caused the Assembly to proclaim the Republic and put a motion to this effect in front of them, then I would say that it was I who did all this and it would not be erroneous to admit that Rauf Bey was capable of giving an account of this fact better than anyone else. If this presumption should be erroneous we would have to come to the conclusion that Rauf Bey has never known me he who declared that he had not only sentiments of comradeship and brother hood towards me for many a year, but also feelings which were reciprocated of confidence and profound respect. To interpret my actions as being of a nature to alarm the public and to express himself to this effect, by assuming the right of speak- ing in the name of the people, who, however, had manifested their joy, meant nothing else than an attempt artificially to spread such alarm. When accepting the stipulations of the armistice of Mudros as they were, relating to strategical questions which exposed the whole of the country to the enemy s occupation, did Rauf Bey not feel then how alarmed and dismayed the nation was? This man, in whose favour his supporters led an organised campaign on the very day of the proclamation of the Republic by putting under his picture the ever-recurring inscription: “Rauf Bey, signatory of the armistice of Mudros, who has taken revenge at Lausanne,” this man, I say, ought not to have driven things so far as to pretend that he understood the real aspirations and the inner most feeling of the nation better than we, nor that he had a more vital interest in these aspirations and feelings than ourself. These words are lacking in logic. Rauf Bey began by saying: “It is the Assembly which exercises the National sovereignty without reserve or restriction.” Who are then these responsible men who ought to demand an explanation from them concerning the reasons why they have adopted a legitimate resolution of high importance and proclaimed this resolution, for the purpose of making them known to the people? If the system of government in a country or in a social corporation is altered, there must be reasons for the alteration. But are those who make this revolution obliged to convince their adversaries who have no desire to understand anything? The Republic had undoubtedly its supporters and its adversaries. Even if its supporters had tried to explain to the adversaries the con- siderations they had in view when they thought it time to proclaim the Republic and to prove to them that they had been right in think ing and acting in this manner, can it be expected that they would have succeeded in breaking their intentional stupidity? It is evident that the supporters would have realised their ideal one way or another, if they were capable of doing so, be it by way of insurrection, revolu tion or in a legal way. This is the duty of everybody who nourishes a revolutionary ideal. On the other hand the adversaries would naturally raise protests, sound alarms, undertake reactionary attempts, as Rauf Bey and his supporters had done when the Republic was proclaimed. At the same time our Army Inspectors in Constantinople expressed their views and feelings in interviews with journalists and in speeches which they delivered during banquets organised for different occasions. After the proclamation of the Republic there were also persons and journalists in Constantinople who had the idea of making the Caliph play a role. Requesting us in such phrases to define the rights of the Caliphate, to a certain degree they threatened us by letting us know that the Mohamedan world, that had hitherto excused us, could act quite differently in future. On the other hand they tried to attract the attention of Islam for the purpose of inducing it to influence us on this question. This article, which appeared in the journal “Watan” dated the 9 th November, 1923, was followed by an open letter to the Caliph, which was published in the newspaper “Tanin” on the 10 th of the same month. In order to prove the extent to which the nation was agitated by the rumours which were circulated about the dismissal of the Caliph, they had invented in this letter, which was signed by Lutfi Fikri Bey, an incident which was said to have happened on board ship. As soon as the passengers heard the rumours they were seized by a feeling of unrest and sadness. Even those who did not know one another had given themselves up to long, frank discussions. A common anxiety had made them friends in a moment. Strangers did not attack the Caliphate; it was the Turkish nation that could not protect itself from attacks. Those who attacked the Caliphate were not Mohamedan nations who were jealous of Turkey, but Mohamedan peoples who had fought under the flags of the English and French against the Turks at the Dardanelles, in Syria and the Irak. For the purpose of easily attacking the Turkish nation, it was said that the abolition of the Caliphate, the maintenance of which they preferred, would be suicidal for the Turkish world, and they pretended that we Turks in proclaiming the Republic tried to abolish the Caliphate. Such publications undoubtedly did not remain without effect. Lufti Fikri Bey s apprehensions expressed in his open letter in the “Tanin” were confirmed on the following day by the chief editor of the same journal. When we read the leading article of the “Tanin” on the II th No vember, 1923, under the heading “And Now the Question of the Caliphate,” we saw that those who could not have prevented the proclamation of the Republic were manoeuvring now in order to maintain the Caliphate at any cost. The “Tanin,” which tried to win the minds of the people for the dynasty by publishing letters from Ottoman princes, alleges in this article that the rights of the dynasty had been the target for a mean attack and that the aggressors be longed to the elite of our party. Their intention was to incite the Assembly against us and to assure the fact that after the proclamation of the Republic had been decided upon, the Assembly would abstain at least from carrying through the abolition of the Caliphate. “No great sagacity is necessary to understand that if we lose the Caliphate, the Turkish State, comprising between five and ten million souls*), would have no longer any weight in the Mohamedan world, and that we would degrade ourselves in addition in the eyes of European diplomacy to the rank of a small state without any importance. As I have already explained my views concerning the Caliphate, I believe it unnecessary to submit these statements to another analysis. I shall restrict myself simply to saying that great sagacity is by no means required to understand that a form of government demanding an unconditional adherence to the Caliphate could not be a republic. According to the census of 1927 Turkey had nearly 14 million inhabitants. The chief editor of the “Tanin” had declared himself a republican; but a republican who wanted to see at the head of the republican government a member of the dynasty as Caliph. Without this, he said, the accomplished fact would not be in accord with reason, patriotism or national sentiment. According to his opinion we were to protect the Caliphate in such a manner that would make it impossible for it ever to escape from us. The manoeuvres undertaken in this spirit had been wrecked . . . The significance of these articles and the aim of these reasonings are easily to be explained to-day. To-morrow they will be under stood still better. Do not suppose that the coming generations will be astonished that at the head of those who relentlessly attacked the Republic on the very day of its proclamation were exactly those who pretended to be republicans! On the contrary! The enlightened republican sons of Turkey will have no difficulty in analysing and penetrating into the real mentality of these pre tended republicans. They will easily understand that it was impos sible to maintain a form of government which after having proclaimed itself a republic would have undertaken the obligation of preserving under the title of Caliph at its head a rotten dynasty, and this in a manner which would never have made its removal possible. In the newspapers of that time two other questions were also brought forward. The one was my illness and the other the services rendered in Turkestan by Enver Pasha, who, it pretended, was still alive . . . It appears that the latter during his stay in foreign countries worked for the cause of pan-Islamism; he used the title of “Son-in-law of the Caliph,” and had this title even engraved on one side of a seal that he had made for himself in Turkestan. These questions were naturally not constantly discussed without a certain aim in view. Those who had rallied around this principle had nearly all revealed themselves through their speeches, their attitude and their writings. It was only to be expected that Rauf Bey would be elected President of this group. This party, which consisted of elements of different factions, believed it had found in the person of Rauf Bey the most suitable defender for the assertion of their thoughts. They believed that they could found their greatest hopes on him. Meanwhile Rauf Bey started for Angora. According to the state ments of the newspaper “Watan,” a great crowd accompanied him to the railway station, at the head of which were Kiasim Kara Bekir Pasha, Refet Pasha, All Fuad and Adnan Bey. Speaking of this the “Watan” announced to the nation the political attitude which Rauf Bey would take up at Angora, in the midst of the Assembly. 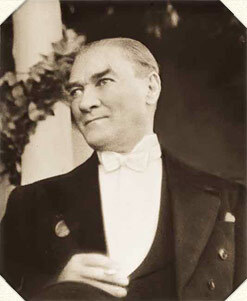 In a very clear manner it was said that Rauf Bey s activity would not be personal and negative, but that he would have in view the welfare of the nation and the respect of the laws, that he would defend in the Assembly salutary principles by creating an element of order and discipline. Undoubtedly we ought not to concede the right to the proprietor of the newspaper “Watan” of providing such information and asser tions for himself. Rauf Bey had been elected deputy in the name of our party. He had to follow our programme, and could not adopt an independent position before resigning from our party. Up till now, however, he had not revealed his deviating opinion. In his persistency to remain attached to the party he had even stated that he had no intention of leaving it. There was no explanation for the personal policy he pursued of continuing to belong to the party but violating its discipline. It was soon easy to discover the result he was trying to reach through this line of conduct. If you wish it, I will tell you about this. After his arrival at Angora Rauf Bey entered as comrade into frequent conversations with the members of the party. It became, however, soon noticeable that all these conversations aimed at the realisation of an aim. Supplementary to his declarations made in Constantinople Rauf Bey had said: The Assembly and the Government must prove to the nation that this haste had a logical and legitimate reason, and they will do so.” We understood therefore very well that the con versations which he had day and night aimed at instilling his views in the members of the Assembly and the party. As soon as he had succeeded in this effort he would try to bring the question of the proclamation of the Republic once again into discussion. The aim which he pursued in this was to force the Assembly and the Govern ment to prove whether there was a convincing reason for the pro clamation of the Republic. According to his opinion and the conception of his adherents it would be difficult to indicate this reason and as soon as the errors committed had become evident, they would at once set to work to rectify them. Gentlemen, a week sufficed to penetrate through the aims and intentions of Rauf Bey. It is natural that the Republicans could not suffer any longer an activity of this kind whoever its promoter might be. Those who discovered the game which Rauf Bey was trying to play resolved to submit him to an examination at a meeting of the party. You will remember this meeting. The discussions which took place there having been published in full they must be known to you. I shall not enter into the details of these discussions. For the purpose of enlightening public opinion I believe it useful, however, and necessary to analyse the situation as it was at that time in order to explain the real meaning of the final result. First of all I must frankly say that Rauf Bey was attacked whilst he was still occupied with the completion of his own preparations for attack. It is true that the hostile articles of certain newspapers, the attitude which the Caliph and one of the princes had been assumed to take, the visits which Rauf Bey, Adnan Bey and some commanders had paid to the Caliph, as well as the outrageous criticisms which were directed against those who spoke or wrote against the Caliph and the prince had not failed to cause a certain uncertainty in the country and to confuse people s minds. But it appears that this had not been sufficient for going over to the attackers, and that the necessity had been felt for working in Angora on the members of the Assembly. It was during the course of these preparations that the aims of Rauf Bey were anticipated. A motion was presented to the President of the Cabinet group of the party. Ismet Pasha was their president. The motion was to the effect that “the declarations of Rauf Bey, published in the Constantinople newspapers, were of a nature to weaken the Republic by reason of their hostile character, and that the impression had been created that an opposition party was going to be formed around the originator of these declarations,” and it contained the proposition that this fact should be submitted for the deliberations of the group of the party. On the day of this sitting, namely the 22 nd November, 1923, I was in the room which adjoined the hall where the discussion was going to take place. Rauf Bey came there and begged me not to intervene in the discussion, because, as he said, it would be impossible for him to give me a reply. I told him that I should not intervene in the discussion and that I had no intention of addressing the meeting, but that I should go into the Council room to follow the course of the debate in my capacity as President of the Party. He begged me also not to enter the Council room. This I refused. What was the real reason for wanting to exclude my presence and my intervention in the debate? Was it really his respect for me which prevented him from declaring himself in my presence as my adversary? Should we believe this? Afterwards I understood Rauf Bey wanted to have Ismet Pasha as interlocutor and adversary. Besides he presumed that in my absence there would be members of the group who would take his part. The group of the party met under the Presidency of Isniet Pasha, who vacated the position to somebody else after having explained the object and the importance of the discussion, declaring that per haps he would have to address the meeting. I repeat his words verbally: “None of us, I believe, can contest the fact that the errors committed in the application of very firm principles although this application was begun in full sincerity could have had the result of weakening these principles which have cost so many sacrifices.” Let us stop for a moment at these two sentences. What is the work that Rauf Bey wants to criticise? Is it the Republic or its proclamation? The work is the Republic. Its proclamation would have taken place in one form or another. And what is the firm principle of which he speaks? Is it that of the Republic? Is it the Republic which he fears to see crippled as a consequence of the errors committed in its application? Gentlemen, it is the question of the Republic itself as well as of its proclamation. It was evident that Rauf Bey giving these well-premeditated explanations to the meeting wanted to withdraw certain points in order to be able to explain his views by means of these subterfuges without raising the ill-feeling of the party against himself. In fact, he had not abandoned his essential point of view. Notice, for instance, the following words: “You will remember that as answer to the question, Which is the form of the Turkish Government? our eminent President had from this platform announced as a positive reply that the form is the Grand National Assembly of Turkey. Which form of government does this resemble? he was asked. Ourselves, he answered at that time, for we resemble ourselves. This is a form of government which is peculiar to ourselves. This was an eloquent answer which has reassured my conscience. “Convinced that you will not judge those who are inspired by such feelings as being reactionaries, I should like to say that certain persons were in doubt and uncertainty and asked themselves whether this regime in its turn would not also be considered insufficient and whether there was not still another more perfect form. Gentlemen, to pass from the monarchical to the republican system of government we have gone, as you know, through a transition period. During this time two ideas and conceptions constantly knocked against each other. One of them aimed at the maintenance of the monarchy. The supporters of this idea are known. The other idea wanted to put an end to the monarchy and carry the republican regime through. That idea was ours. We hesitated clearly to announce our ideas. Consequently we were forced to frustrate the application of the ideas professed by the monarchists whilst we reserved to ourselves the possibilities of application so as to arrive later at a suitable moment for their realisation. At the promulgation of the new laws, and especially of the law of the Constitution, the Monarchists insisted on their demand to define the rights and prerogatives of the Sultan and Caliph, whilst we on our part believed it to be useful to pass this point in silence. We therefore said that the moment for it had not yet arrived and that there was no necessity to proceed to do this. Without referring to the Republic we began to organise the ad ministration of the State according to the principles of national sovereignty and to give it a form that made its development into a republic possible. It was necessary persistently to preach that there was no higher authority than the Grand National Assembly and to prove the possibility of the country being governed without the monarchy and without the Caliphate. Without giving the Chief of the State a name we had practically entrusted the President of the Assembly with his authorities and he effectively exercised them. The real President of the Assembly was actually its Vice- President. A government existed but it was called the “Government of the Grand National Assembly,” We abstained from adopting the Cabinet system, because the monarchists would immediately have stood for the necessity of permitting the Padishah the use of his prerogatives. During the phases of the struggles of the transition period we were forced to adopt this form, this system of government of the Grand National Assembly. Endeavouring to move us to call this form of government ex plicitly a constitutional regime, our adversaries were justified in finding that this form was imperfect, and they expressed their dissent in the following terms: “To whom and to which form of govern ment does the one which you want to create resemble?” To such questions, which were put for the purpose of forcing us to explain ourselves, we had to give such answers as corresponded with the exigencies of the time for the purpose of reducing them to silence. Rauf Bey said that one of these answers seemed to him con- testable and of a nature to reassure his conscience, and on this one he based his views and assertions. The lack of logic in this argument is evident. Would a person whose “sacred feelings forced him to be an adherent of no other form of government than that of a republic,” a person who was well aware that the government of the Grand National Assembly was a necessity of the transition period, would this person cling to this regime as to a fixed idea and get disturbed at the thought that at tempts would be made to try to find another form of government because the Republic was also regarded as an imperfect one? What Rauf Bey understood under another form which would follow the Republic” had its own signification. He wanted to say that those who had proclaimed the Republic and thereby dethroned the Ottoman dynasty, had perhaps the idea of themselves occupy ing the throne and thus to restore the monarchical system. Are examples of this kind unknown in history? Persons who put this question are worried about it. “The proclamation of the Republic has spread through the country like wildfire as the sacred ideal of the nation. “Rauf Bey, we make a policy. It is important that we should point out our mistakes, one after the other. Replying to the statement that too great a hurry had been shown, Ismet Pasha declared: “Comrades, there can be no question of haste for a result which has been found to be quite natural. It is only in the case where an error is possible, that one can speak of haste . . . In the course of his statements Rauf Bey desired to compare our procedure in the proclamation of the Republic with the conduct of the former Central Committee. The question of the visit to the Caliph is the question of the Caliphate itself. As statesmen, we ought never to forget that the armies of the Caliph have laid this country in ruins from one end to the other. We must never lose sight of the possibility of the creation of armies of the Caliphate … It is to the army of the Caliphate that the Turkish nation owes its most cruel sufferings. It will no longer allow this to happen. “We shall never forget that it was a Fetwa of the Caliph which threw us into the horror of the general war. We shall never forget that when the nation wanted to rise, a Fetwa of the Caliph provoked against us a still more terrible assault than was that of the enemy. Rauf Bey, after making a long defence of his position, declared that he would not form a new party nor leave the People s Party. He concluded his speech with words full of modesty which were intended to produce feelings of magnanimity and compassion from the Assembly and then left the council room. The speakers remained without interlocutors. After Rauf Bey had recognised that he had made a mistake and had declared himself a republican, the debate was regarded as at an end. They contented themselves with deciding to send a communique to the Press for the purpose of removing the suspicions which had been created in the public mind and to have the speeches printed and distributed. Now, Gentlemen, what does this decision mean? Had the confused and ambiguous declarations of Rauf Bey in which he confirmed his republican mind actually satisfied the party? Had the conviction really been formed that he could work within the party with the same feelings and thoughts as we? Was this decision of the party the decision which the actual result of the debates demanded? No. What, in this case, were the factors which caused the members of the party to be satisfied with this decision? I will explain this point to you very briefly. From the beginning to the end of his declarations Rauf Bey seemed by his attitude and language to have counted on the generosity and friendly feelings of the members of the party. On the other hand they were so incoherent and disconnected that it was not easy for everybody to immediately recognise to what extent his speeches were sincere and serious. It is quite certain that the frame of mind of those who attributed to the situation the importance of a conflict between Ismet Pasha and Rauf Bey, which had nothing to do with the question of the Republic, had promoted the adoption of a senseless decision. Gentlemen, this decision gave to Rauf Bey and his friends the opportunity of still working for some time in the party to accomplish its overthrow. On the other hand, the articles which were directed against the highest interests of the country and the Republic, and which were continually appearing in certain newspapers in Constantinople, created such an atmosphere in Stambul that the Assembly believed it necessary to send an Independence Court there. I shall again discuss the question of the Caliphate and the Caliph which appeared on its own accord in all problems which were raised and in each stage of our procedure. In the beginning of the year 1924 it had been decided to undertake a “Kriegspiel” of some importance. It was to take place in Smyrna. For this reason I started for there in the beginning of January, 1924. I remained for nearly two months.